In Familiar, Slade Spencer returns to his hometown and his ghosts of the past when he meets up with his past lover, Susie Vasilly. Slade is a warlock in denial. He also eats the same thing every time he goes into Millie’s Diner when Susie waits on him. Slade, can you tell everyone what I’m talking about? Slade: Of course, Elizabeth, I’d be happy to. Susie always knew my order even before I opened my mouth. I really liked the diner’s Avocado Melt Sandwich. Now, as a warlock I’ve learned I could just manifest this any time I want. But Susie doesn’t like me doing all that “hocus pocus” as she calls it. So for the readers’ sake I’ll list the recipe so they can make it too. Start out with a slice of rye bread, slightly toasted. Also, some sundried tomato pesto spread (any jarred one will do, don’t waste time making it from scratch. I like the Aldi’s Priano brand. ) Add that atop the garlic. 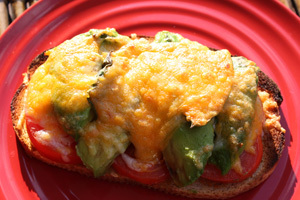 Slice a small tomato and lay the slices atop the bread. 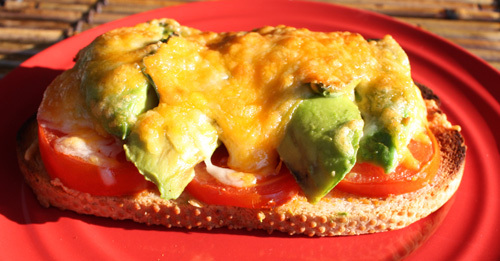 Slice half an avocado and put that atop the tomatoes. Top off with three fresh basil leaves and shredded colby/jack cheese. Put it in toaster oven to melt the cheese until slightly brown. Click book cover to read excerpts or buy. Watch book trailer video from Familiar.